CHENG Rom-shing, grandson of renowned 1960s Hakka opera singer CHENG Mei-mei, reconstituted his grandmother’s opera troupe in 1986. In 1988, he registered the Rom Shing Hakka Opera Troupe as an organization dedicated to preserving and performing the Hakka opera art. The troupe is a proud recipient of a coveted Golden Melody Awards “Best Traditional Arts and Music” award. Since assuming leadership of the troupe, CHENG Yueh-ching has vigorously maintained the troupe’s “freshly elegant” style while beautifully weaving traditional Hakka operatic themes and art forms throughout an extensive performance portfolio and creating new, refreshingly popular theatrical scripts that are keeping the troupe tactfully in step with the times. During the Eastern Zhou period in China (770-255 BCE), the king of Southern Wei led an attack on the territory of Duke Zhuang of Zheng. When the Duke asks who would lead the army, KAO SHU is the first to volunteer. Soon after, however, GONGSUN ZIDU asked for the honor himself. The Duke finally chose Kaoshu as Major Marshal and Gongsun as Minor Marshal. In a jealous, GONGSUN murdered Kaoshu with a surreptitiously arrow shot before battle and took his place at the head of the Southern Wei counterattack. However, after GONGSUN’s triumphant returned, he was regularly harried by the ghost of his victim and became possessed during the banquet. He confessed his crimes, lost what was left of his fragile mind, and spent the rest of his days tortured by a spirit. Eventually, GONGSUN ZIDU died. Chen-yu born in 1989 and good at Sheng (male role). 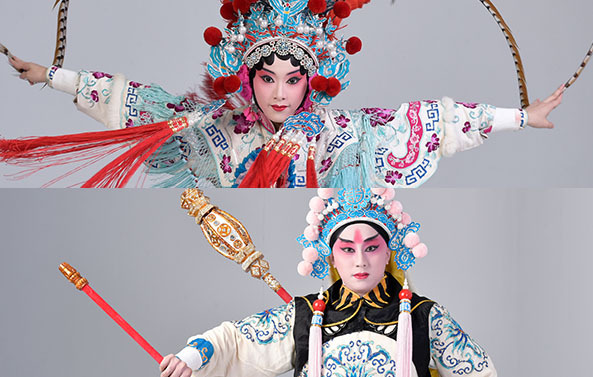 He holds a master’s degree from the Graduate Institute of Art Studies at Fo Guang University, where he focused his studies on Hakka and Luan-tan opera forms. He learned from GUO Hong-tian, LI Zu-xing GU Yi-fan, HUANG Jun-lang and LI Wen-xun. 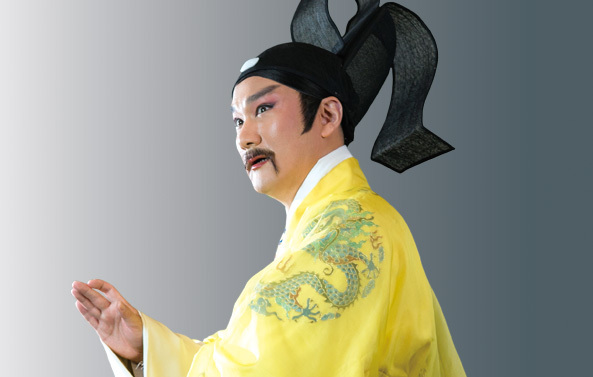 This time he learns the role GONGSUN ZIDU from XIA Song-sheng, who is the most valued actor in Shandong Provincial Peking Opera Theatre. Chen-yu has worked part time as an instructor at the National Taiwan College of Performing Arts, teaching curricula for high school and practicum students. 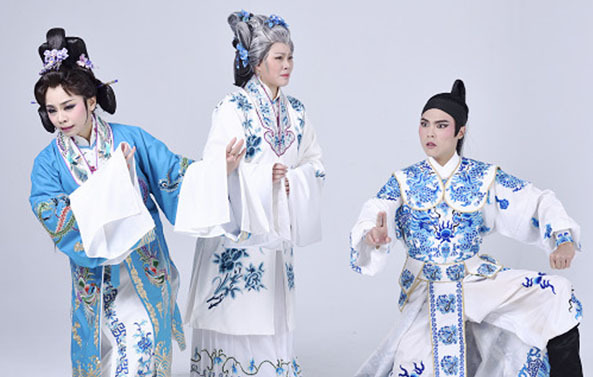 Chen-yu has extensive troupe experience in Taiwan and abroad, including many performances at the National Theater and Concert Hall in Taipei, and is now a key member of the Rom Shing Hakka Opera Troupe. 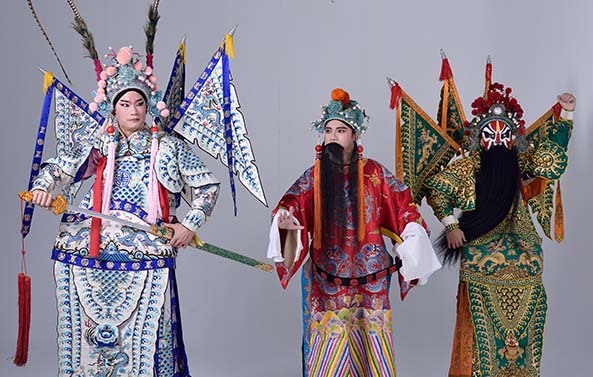 In addition to actively promoting and studying the Hakka operatic genre, he is working to improve his experience in stage direction in order to more broadly promote Hakka opera culture. Chun-hung was born in 1990. He majors in Sheng (male role) and graduated from Department of Hakka Opera at National Taiwan college of Performing Arts. He learned from GUO Hong-tian, CAO Fu-yong, LIU Xiu-hui, HUANG Jun-lang, LI Wen-xun. Chun-hung participated in the Rom Shing HOT training program significantly expanded his knowledge and skills with regard to traditional Hakka and luan-tuan opera forms. 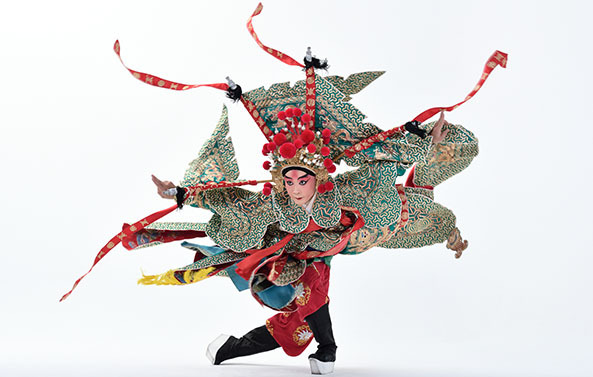 Chun-hung is now a member of the troupe, performing in all recent major Hakka opera productions and traveling with the troupe to the United States, Indonesia, China, Central & South America, and Australia. His extensive stage experience includes numerous performances at the National Theater and Concert Hall in Taipei. Min-chan born in 1999. He is good at WuSheng(male and martial role) and studies in Department of Hakka Opera at National Taiwan college of Performing Arts. He learned from CHEN Si-peng, ZHANG Yu-qiao, HUANG Feng-zhen and HUANG Jun-lang. Min-chan participated in the Rom Shing HOT in 2015 and began apprenticing with the troupe in 2018. He travelled with the troupe overseas and performed many major productions. Furthermore, Min-chan was selected as a Rom Shing HOT Luan-tuan opera apprentice in 2018 and is busily working to master various theatrical pieces in this genre under the tutelage of PAN Yu-jiao. Min-chan is thrilled about his current focus in the traditional arts and looks forward to following in the footsteps of troupe ‘elders’ and delving further into the highly refined art of Hakka opera. Today the number of：57人 / The total number of visitors：131,019人 / Last Updated：2019/04/19.